Clay Aiken – In The News! Did you watch Bold on Friday morning? If you did, you were not alone. It seems many people watched the show and some of them even wrote about the show and Clay Aiken. Former Fox News host Gretchen Carlson said Friday that Republicans who continue to support Alabama GOP Senate candidate Roy Moore are indicative of the “abyss” that American politics has reached. …Bold TV host and former “American Idol” star Clay Aiken asked Carlson if voters are the ultimate judges in such cases. Carlson said President Trump’s election last year proved they are. They also posted a YouTube of the conversation. It’s good to know that Bold is seen by other sites. It is growing and I imagine it will get more popular as it is an excellent show. On Sunday night, ABC broadcast the American Music Awards. The American Music Awards, known as the AMAs, are given to top performers throughout the music industry on an annual basis. Awards are given in the Pop/Rock, Country, Rap/Hip-Hop, Soul/R&B, Alternative, Adult Contemporary, Latin, Soundtracks and Contemporary Inspirational genres of music. In addition to the awards in each of the genres, an Artist of the Year is named from all groups combined. The AMAs are voted on by a poll of music buyers and the public. The American Music Awards have nominations based on sales, airplay, activity on social networks, and video viewing. 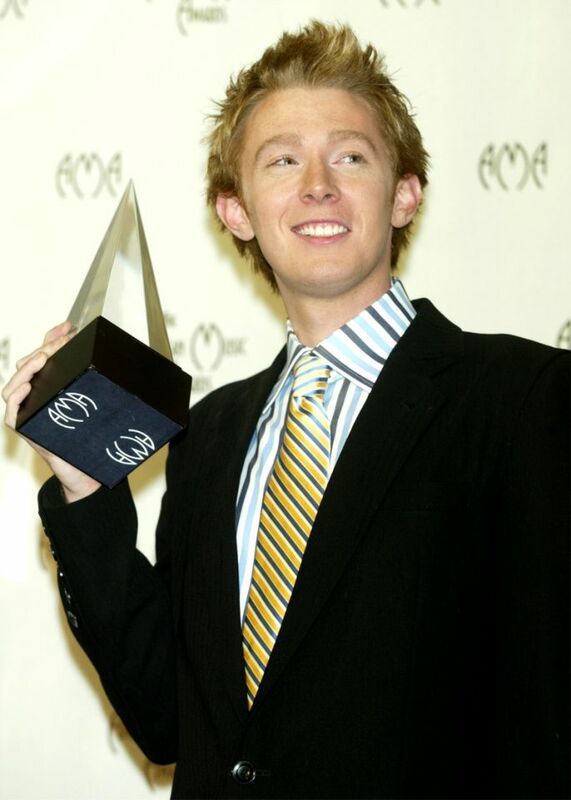 Clay Aiken has attended and participated in the AMA’s three times. On November 16, 2003, Clay played a large role in the show. He arrived on the Red Carpet with his friend Amber Nix and was nominated for two awards, Favorite Male Artist and Fan Choice. Clay won the Fan Choice Award. Clay also performed on the program. 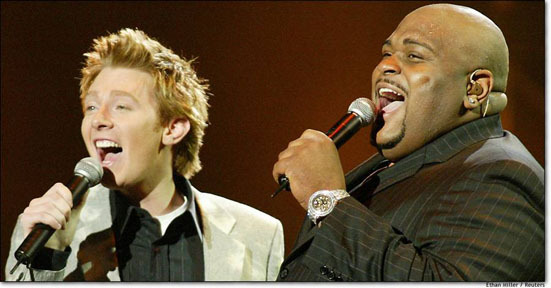 Clay sang a short version of Invisible and was then joined by Ruben Studdard for an outstanding rendition of Jesus Is Love. They received a standing ovation. On November 11, 2004. Clay was a presenter on the program. He was joined on stage by Kathy Griffin who was dressed as a bride. She announced to the audience that she was going to marry Clay. Despite the distraction, Clay was able to present the award for the Best Male Country Artist. Clay hit the Red Carpet one more time at the AMA’s. In 2006, Clay participated in a skit with Tori Spelling. The two made fun of Clay’s tiff with Kelly Ripa and received lots of laughs and applause. 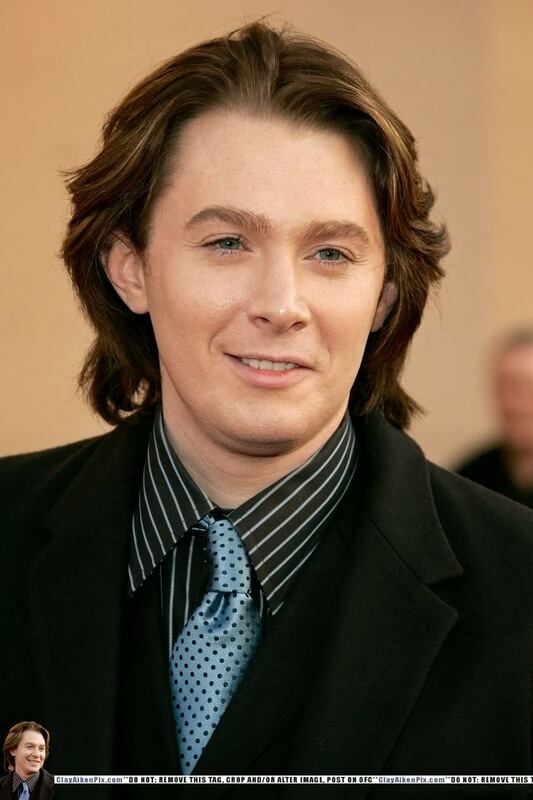 I have to admit that the only times I have watched the show are the three times that Clay Aiken was a part of the show. I am not a huge fan of popular music and so the shows are just not my cup of tea! The following video is fun. Clay was amazing when he sang at the AMA’s. I wonder if Clay watched the AMA’s last night! I watched and taped all 3 of the years that Clay was on the AMAs. I have only watched the show when Clay was on, too! Absolutely loved when Clay and Ruben sang and when Clay won his award! Thanks for the report on Bold – I have not seen it yet but hope to soon. It's been a busy time with Thanksgiving very near. BOLD was a great show. The conversation with Gretchen Carlson was profound and inspiring. I'm with you on the AMA"s, only watched it with Clay on the show! Thank you for the video and article on OMC! BOLD was informative as usual. Gretchen Carlson had a lot to say about women in the workplace and how to deal with situations that arise with superiors using their power to intimidate those under them. Clay always has great insight and makes intelligent statements and asks good questions of the guests. I, too, have only watched the AMA when Clay is on. Error: Error validating access token: Session has expired on Tuesday, 21-Aug-18 16:13:01 PDT. The current time is Friday, 26-Apr-19 01:53:24 PDT.